Need funding for a project promoting Cultural Diversity & Inclusion? 9/13 – Hi-Tech Facts – Millersville included in article on how colleges did in U.S. News & World Report rankings. 9/13 – York Daily Record – Millersville’s Eric Horst interviewed for article on remnants of Irma. Need funding for a project promoting Cultural Diversity and Inclusion? Register your Club or Organization for the Fall Open Houses. Join a Faculty Learning Community! Register your department for the Fall Open Houses. MU Student Chapter of the International Association of Emergency Managers Selected as 2017 Student Chapter of the Year. 9/13 – Lancaster Online – Feature article on “Butterfly” at Millersville. Millersville mentioned in article on S. News rankings. 9/12 – Blue Ridge Cable Channel 11 – Millersville’s Jayme Trogus interviewed on status of Title IX at Millersville. Millersville mentioned in article on Title IX. Millersville’s Eric Horst interviewed for article on muggy weather. Soccer – Millersville’s senior defenseman Kody Eberly earned PSAC Player of the Week Honors. Watch YouTube Coverage: MBT Student Lauren Hill rocks with Kiss’s Gene Simmons – Opportunity came about due to the partnership of American Music Theater and MBT along with Gene’s Tour Manager. Men’s Soccer – Millersville won 1-0 over Wheeling Jesuit. Women’s Soccer – Millersville won 5-0 over Pitt-Johnstown. 9/9 – LNP – Volleyball – Millersville women swept USciences. 9/7 – Blue Ridge Cable Channel 11 – Feature story on the “It’s on Us” campaign included interviews with Millersville student and Peer Health Educator, Amanda Hardin. 9/8 – LNP – Golf mention – Millersville senior captain Connor Sheehan finished as runner-up at the Glade Springs Intercollegiate Invitational. 9/7 – LNP – Millersville’s Dr. Dennis Downey will discuss “Pennsylvania and the Gospel of Eugenics: Disabilities and Public Policy, 1880-1930” at the 9 a.m. Millersville Area Historical Society meeting Saturday, Sept. 9. 9/6 – Lititz Record Express – Millersville’s Dr. Xun Pan will appear in concert this Sunday at Brethren Village. 9/6 – Ephrata Review – Professor emeritus Dr. Jack Fischel spoke at opening to “Forbidden Art” show. 9/7 – University Business – Cheyney University submits plans to save its accreditation. 9/8 – Women’s Volleyball vs. USciences, 7 p.m. In the SMC MPR – Organization Outbreak! September 6, 3 p.m. – 6 p.m.
9/5 – Standard-Speaker – Jeff Sweda, a former wrestler at Millersville, will be inducted into the Hazleton Area Sports Hall of Fame. Organization Outbreak! September 6, 3 p.m. – 6 p.m.
Men’s Soccer – Flickinger nets game winner for Millersville in overtime win. Women’s Soccer – Millersville draws at California. Women’s Cross Country – Rudderow leads cross country at Alumni Run. 9/5 – Lancaster Online – Millersville’s Eric Horst’s tweet used in Severe thunderstorm could arrive in Lancaster County this afternoon, forecasts say. 9/2 – LNP – Millersville’s professor emeritus, Dr. Leroy Hopkins interviewed for Bethel A.M.E. Church, a rock for generations of Lancaster African Americans, is set to celebrate its 200th anniversary. 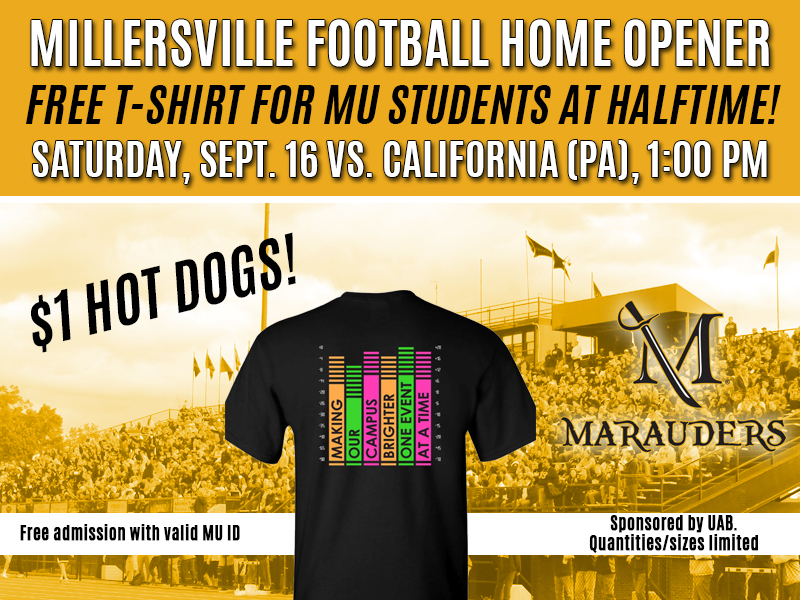 9/2 – Lancaster Online – Millersville University drops football season opener at Pace. 9/2 – Stonehill Skyhawks – Early second half surge the difference for Marauders in opener. Millersville’s Dr. Dennis Downey interviewed for article, Pastors group says Civil War-era statues should stay, but others argue those memorials need to promote reconciliation. Millersville football coach Greg Breitbach expects Marauders to have more depth, be more competitive. List of how you can help Hurricane Harvey victims includes MU’s Student Senate clothing drive. 9/1 – bctv.org – Millersville student, Carlee Nilphai mentioned in story, Immigrants Offer Their Stories At Third Community Journalism Project. 8/31 – LNP – Robyn Lily Davis, Ph.D., the Colonial and American Revolution specialist in the history department of Millersville University, will speak at Rock Ford Lecture Series.